For Mother’s Day, I prefer the gift of food over a bouquet of flowers. Dessert is always the first thing I think about for my mom since she loves sweets. I wanted to make a pie but nothing difficult so I used puff pastry as the crust and topping instead of making my own. For individual portions, I ended up using the same ramekins I baked my veggie pot pies in. But feel free to use a regular pie pan and double the recipe. And best of all, this recipe only uses 6 ingredients! So try baking this for Mother’s Day. Mom will surely be impressed! 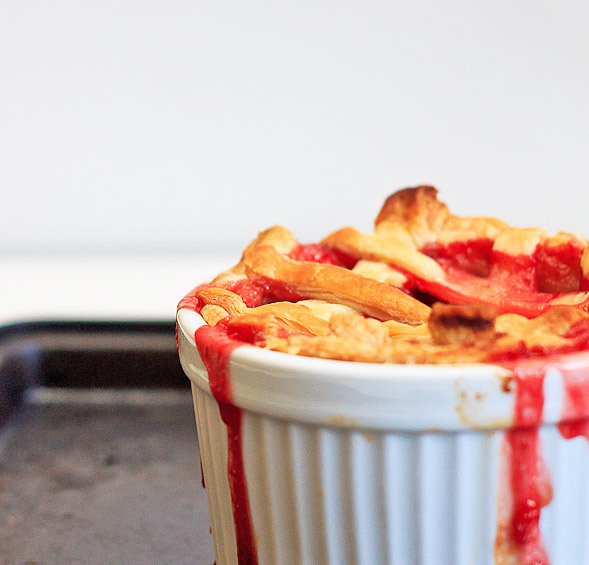 I love how simple this recipe is and it’s the perfect pie to make right now as strawberries are in season. 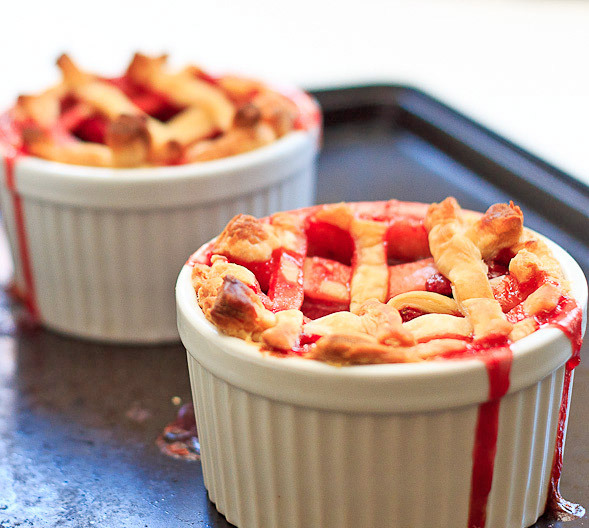 The strawberry filling oozes down the sides of the ramekins, so when you’re ready to bake, place them on top of a sheet pan for the drippings. 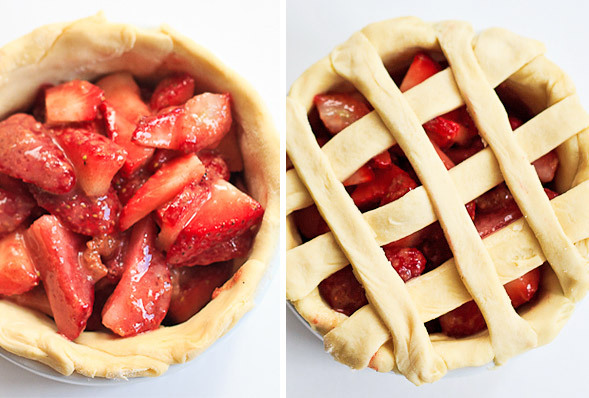 Serve these strawberry pies with whipped cream or a scoop of vanilla ice cream. If you have leftover puff pastry, try my easy puff pastry sticks. 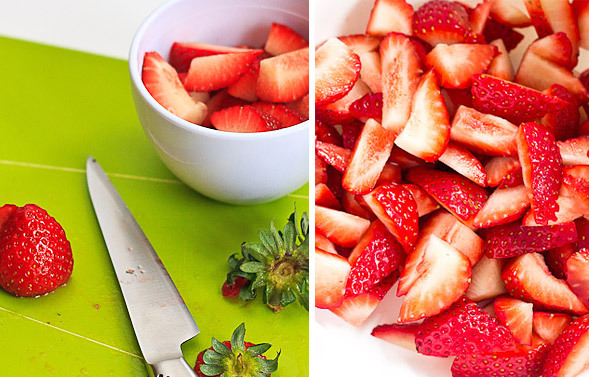 Wash, hull and quarter strawberries and place in a bowl. 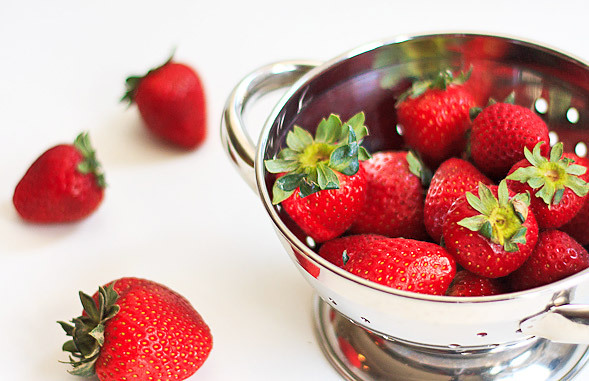 Mix strawberries with flour, sugar, lemon juice and cinnamon. Roll and cut puff pastry sheet big enough to place inside ramekins. 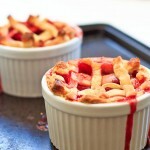 Fill ramekins with the strawberry mixture. 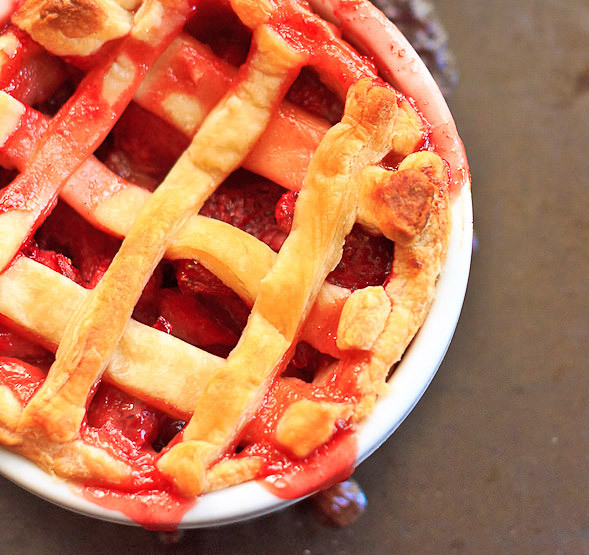 Make a criss-cross pattern on pies, then bake. Cool pies before devouring. Serve with whipped cream or vanilla ice cream. Heat oven to 400°F. Lightly spray large ramekins with oil and place in the fridge (this helps shape the puff pastry better). 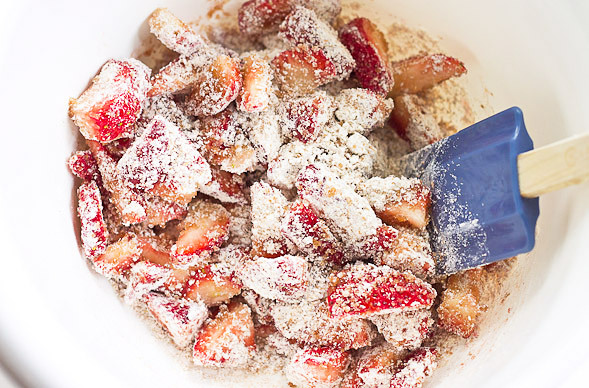 In a bowl, combine sugar, flour, lemon juice and cinnamon, then mix in strawberries and set aside. 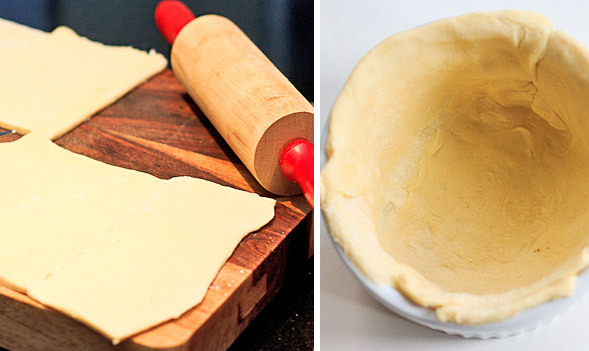 Roll out thawed puff pastry and cut out pieces large enough to fill the insides of your ramekins. Press each puff pastry piece inside ramekins, then fill each with strawberry mixture. Cut thin strips of puff pastry and arrange across the tops of the ramekins in a criss-cross pattern and pinching each seam. Place ramekins on a sheet pan and bake for 30-40 minutes. Allow to cool. Serve with whipped cream or ice cream. Oh hey! I had a strawberry mother’s day, too. Only I made tarts. this looks awesome and I might have to try it one of these days. I still have a sheet left in my freezer from last Sunday’s. Hi Janis! Strawberry tarts sound great for Mother’s Day 🙂 Try this recipe out sometime, it’s super easy. I’m making these right now! Thank you for the recipe!! You’re very welcome, Lynette! Try them with ice cream! can you just mix vanilla extract in instead of making the vanilla sugar? If so how much vanilla extract would be appropriate to use? Hi Tosh – Depending how much vanilla flavor you like, try using 1-2 teaspoons of vanilla extract. Have fun baking!